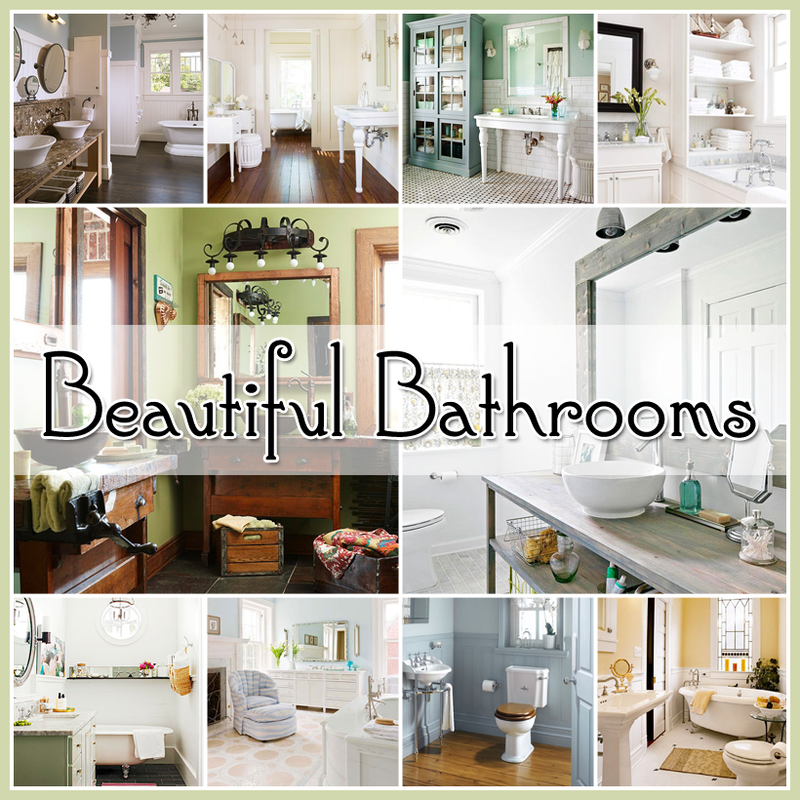 Today we are going to have a look at a few beautiful bathrooms. If you are planning on some renovations…one of these beauties just might give you some inspiration…if not…they are fun to look at! 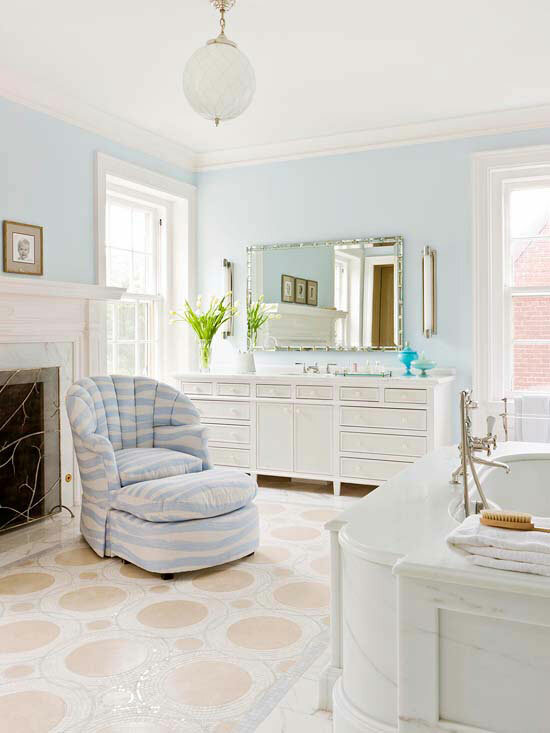 Such a clean…fresh and crisp looking room…all beautiful in blue and white. 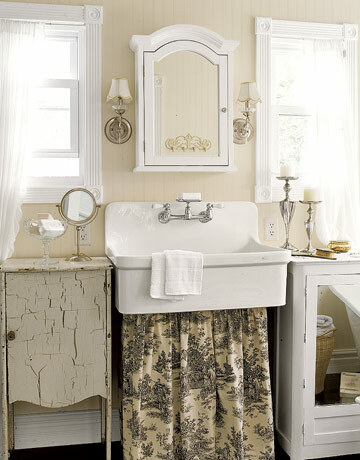 The tub and faucet are amazing…loving the ornate shabby feet. A blend of vintage and modern and it sure work. 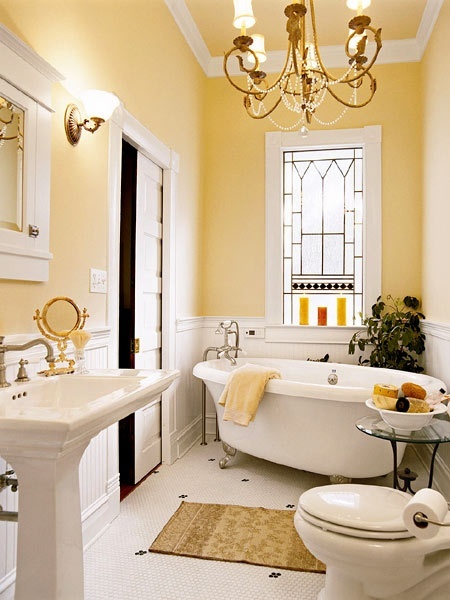 Here is an amazing bathroom…the bead board walls…marble counter tops…amazing sinks and tub…the faucets in a tarnished brass are simply fabulous. The hardwood floor is a wonderful contrast. Then the touch of wicker and crystal are perfect! 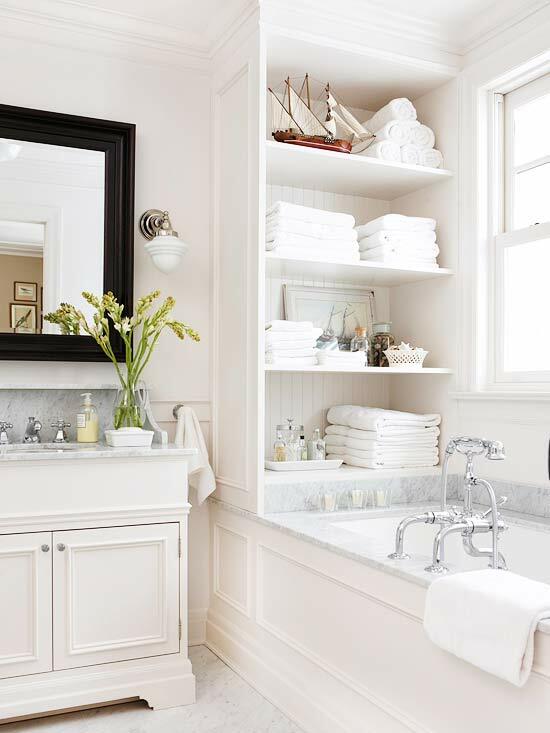 I do believe that if I were to have the bathroom of my dreams…this would be it…that is if there is a shower hiding some where : ) This creamy and oh so dreamy room is sheer perfection. Here is a wonderfully white bathroom. I love the built in storage by the tub and using bead board as the back drop adds a ton of style and flair to the space. Here is another example of how bead board can give a room depth and character. The combination of the white bead board and the dark wood floor just pops! Wood and white seem to go perfectly… hand and hand! I love this look…simple…clean…a bit rustic and modern in a perfect blend. The open shelving gives you easy access and the assortment of baskets add the character. Better Homes and Gardens says that this is their most pinned room! A bit of luxury! What I really love is that this room gives us so many ideas and inspirations. Using a refurbished mirror…and upcycled dresser…a great light fixture and a fabulous chair…one can create a space like this on a much smaller budget. Speaking of a refurbished dresser…here is a shabbilicious example! 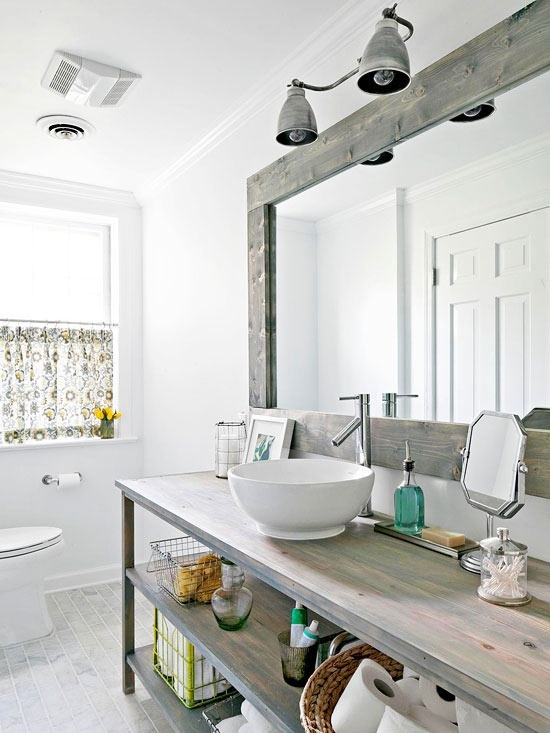 Here is another wonderful example of a dresser upcycled for your bathroom..I love the look and the storage even more! A wonderful use of space. Simple…clean…beautiful and blue! 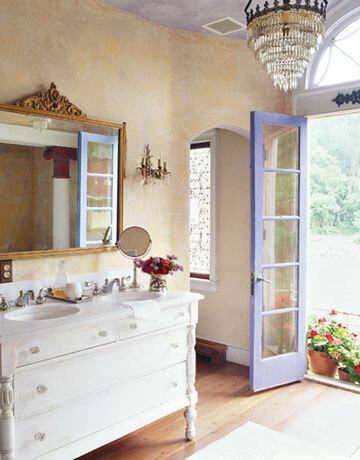 Love the molding design on the walls…the chair rail…hanging the mirror from it is a great touch! This room is so charming! Love the whimsy of the room and the combinations of patterns…a little bit boho and a little bit shabby but oh so pretty! 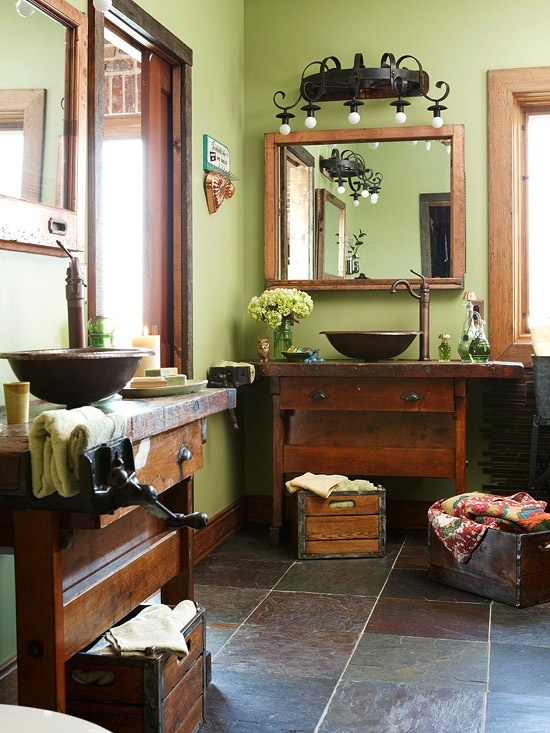 Here is a very rustic looking bathroom that has tons of charm…just look at all of the attention to detail and the use of vintage pieces. I just love this idea…isn’t it FUN! This is an interesting modern space…I really love the chevron stripe look that is created with marble. 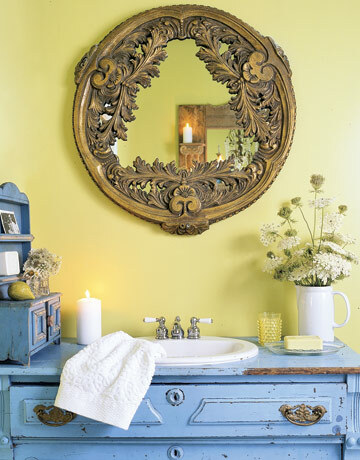 How about this cheerful Cottage style Bathroom…a happy place! 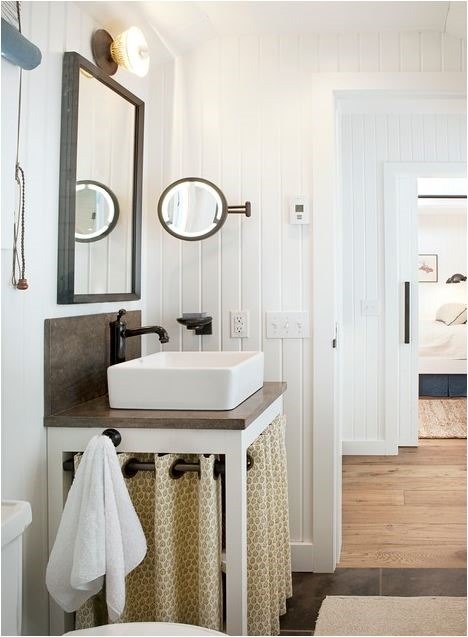 A bit of beadboard…a lovely skirt…a wonderful sink and accessories an voila! 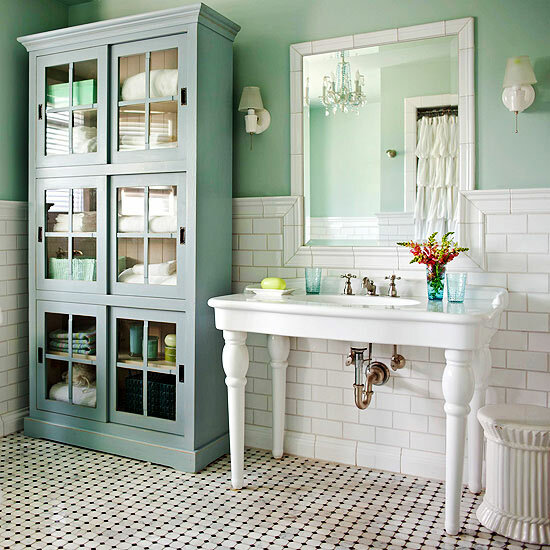 I love the little black and white vintage tile floor! 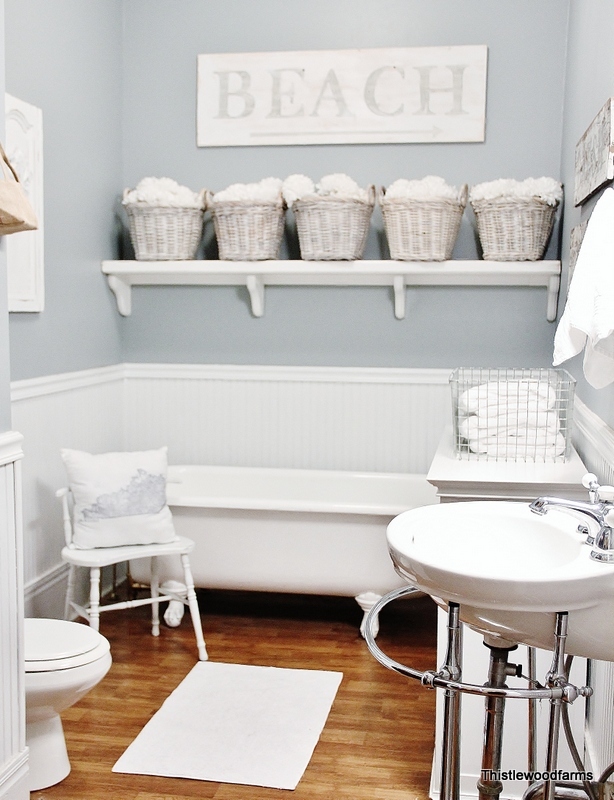 This is a fabulous cottage style bathroom with tons of storage. A lot of inspiration! 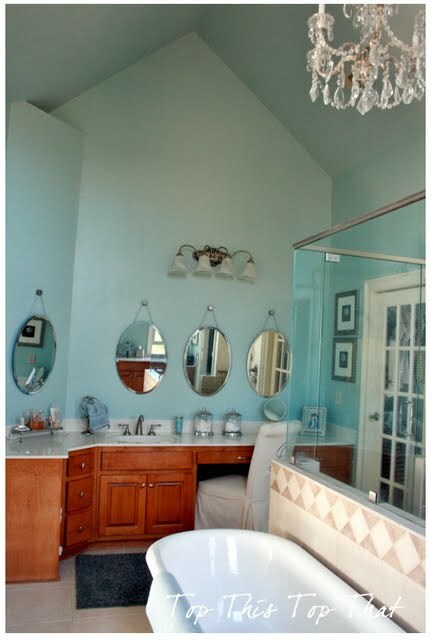 adds a ton of glam and style to her gorgeous bathroom! She shares everything…have a look! 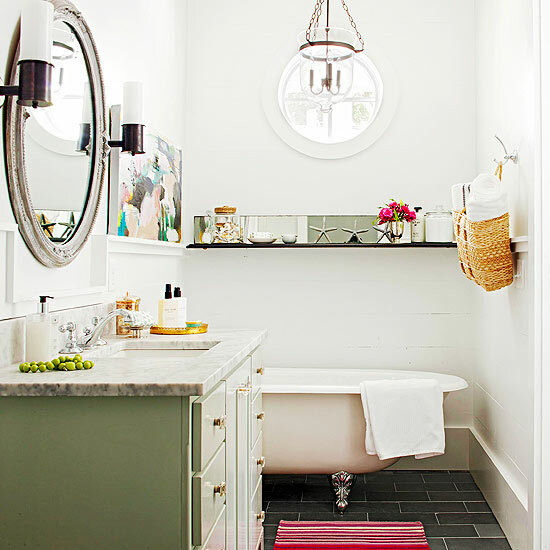 she has tons of bathroom style! 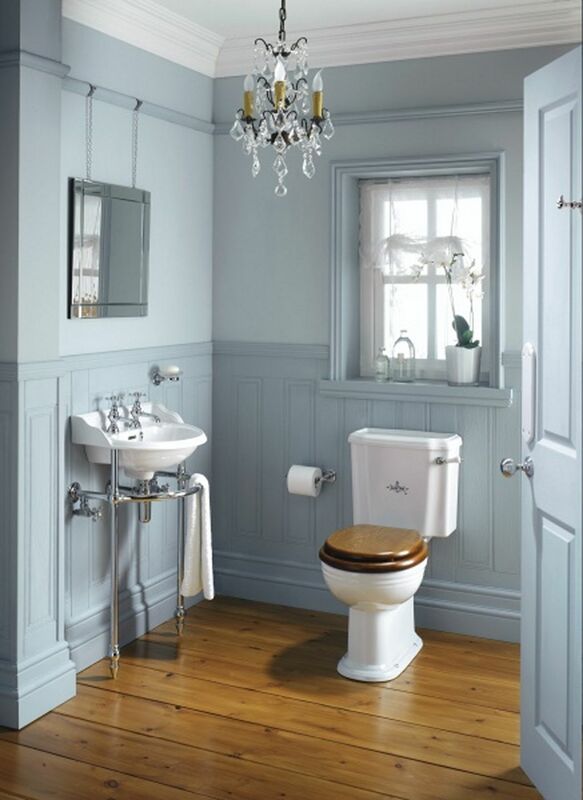 Here is another skirted beauty…so cottage and quaint! 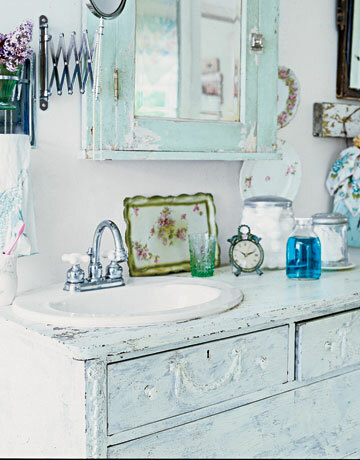 Here is another incredible repurposed dresser…It is fabulous! Love the gray tones and the industrial feel. 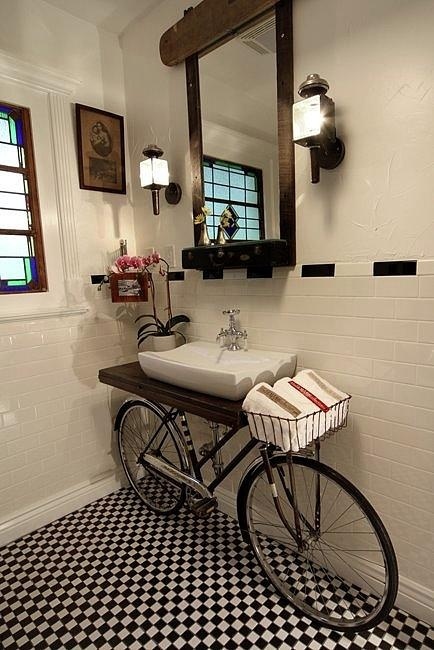 That bicycle sink is too fun! I mean, I wouldn’t want it for my bathroom but you’ve got to appreciate such creativity! Thank you for the tips! I’m looking for some ideas to redesign my bathroom. 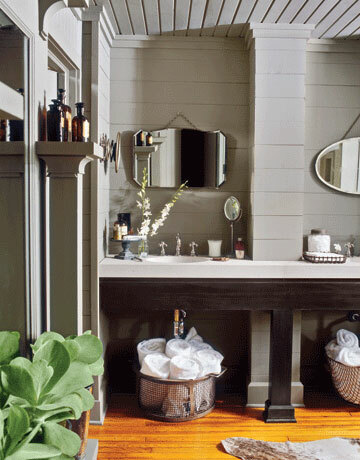 I like the color that the towels and the accessories give to the bathroom. I think it’s a place we should take care of because we spend a lot of time there, and I like clean ans fresh designs!